Check out these Magic Sequin Makeup Bags $11.99 (Retail $30.00). 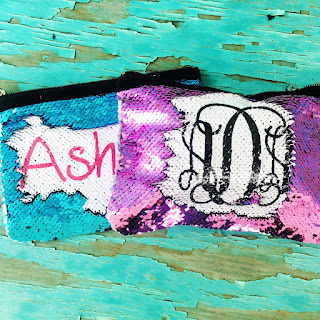 These Sequin Makeup/Pencil Bags are so much fun! We will be personalizing the name just as it is written. These color-changing pillow cases work like magic by incorporating two-color reversible sequins on the front. Slide your fingers across the sequins, and your image will appear. Slide your hand again in the opposite direction to conceal the design behind dazzling, colorful sequins.